The cost of a diamond varies vastly depending on its quality, shape and size. The 4C’s are considered to be the most important quality characteristics of a diamond these are Cut, Colour, Clarity and Carat, the shape of the diamond is also important, this is influenced by the cut. A diamond’s most important attribute is its cut, therefore we recommend selecting the highest cut grade your budget will allow. The cut determines its ability to reflect light and therefore gives it its brilliance, sparkle and fire, the 3 key elements to a diamond’s allure. As shown in the diagram below, when a diamond is cut well, all the light entering the diamond is reflected back out, resulting in its trademark sparkle. If a diamond is cut poorly, the light escapes out the bottom and so does not appear as sparkly. There are 3 types of diamond cut each leading to particular diamond shapes. 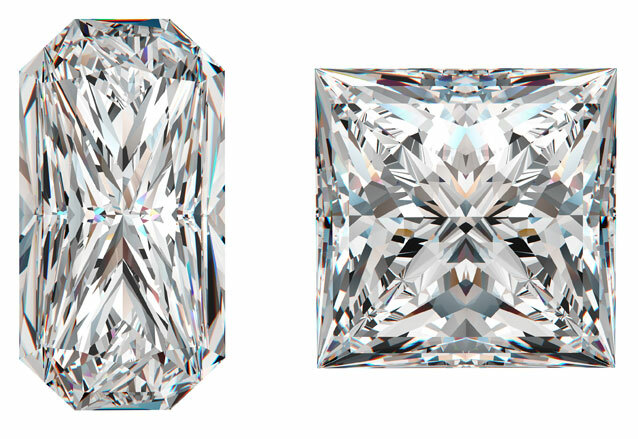 The most popular diamond cut is a brilliant cut. It is known and admired for being the most sparkly of all the cuts as it reflects the light better than any other cut. Modified brilliant cut is a modified version of this popular cut resulting in different shape diamonds. This cut includes Brilliant Shape, Oval Shape, Marquise Shape, Pear Shape and Heart Shape. Step cut diamonds may not reflect light as well as brilliant cut diamonds but they generally have a better clarity grade and are notorious for producing elegant diamond shapes. Diamond shapes with this cut include, Emerald Cut, Asscher Cut, and Baguette Cut. A mixed cut diamond is a combination of both a step cut and brilliant cut. Shapes include a Princess Cut and a Radiant Cut. Jason Keith’s most popular diamond colour is a G, he does not use Z-K rated. Clarity relates to the presence of imperfections. All diamonds have blemishes known as inclusions-how many and what size they are determines a diamonds clarity grade. Diamonds are graded from flawless (F) to Included (I) which have large heavy blemishes visible to the eye. FL – Flawless: No internal or external Flaws. IF – Internally Flawless: no internal flaws, but some surface flaws. VVS1-VVS2 – Very Very Slightly Included: Minute inclusions very difficult to detect under 10x magnification. VS1-VS2 – Very Slightly Included: Minute inclusions seen only with difficulty under 10x magnification. SI1-SI2 – Slightly Included: Minute inclusions more easily detected under 10x magnification. I1-I2-I3 – Included (three grades): Inclusions visible under 10x magnification AS WELL AS to the human eye. Carat is the unit used to measure a diamond’s weight. It is important to remember a diamond is measured by its weight and therefore its Carat may not accurately reflect its size. There are 100 points in one carat. Think about the size of your partner’s finger. If she has small fingers the diamond will appear larger. If you have a setting in mind please bear in mind not all carats and shapes will work so contact Jason directly to enquire. If you’re looking to save a little money, diamonds just below full or half carat weights cost significantly less and small point differences are very hard to see. If a large carat weight is imperative to you (or her! ), but you don’t have a huge budget, you can comprise on one of the other 4 C’s – Colour, Clarity or Cut. Our downloadable PDF is designed to give you an idea of size for different shapes but obvious as carat is based on weight your diamond may vary. There are a number of different forms to a diamond and these are described as shapes. Choosing what shape you would like is very much personal taste with each shape having its own attributes. The most popular diamond is a round brilliant cut it is also arguably most sparkly. Shapes is not to be confused with cut but they are directly related with cut dictating a diamonds shape.